In this video, we will be learning how to multiply and divide positive and negative numbers. 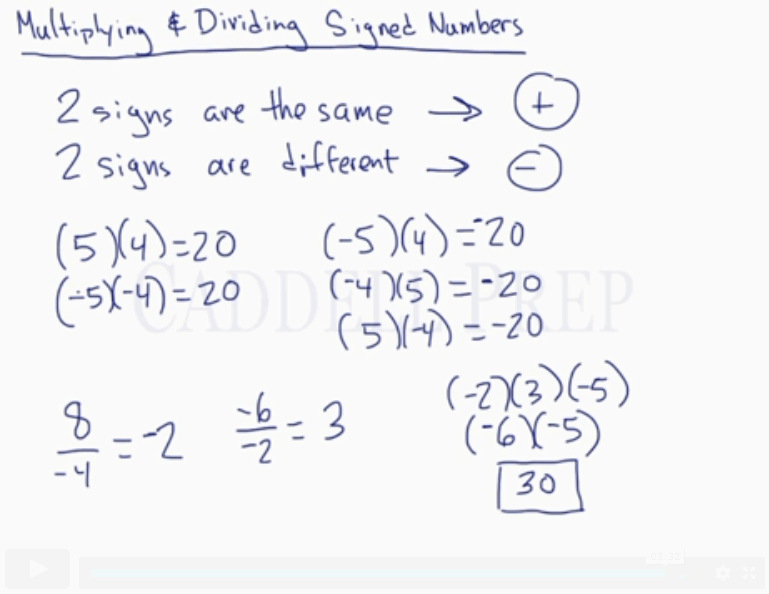 Let’s take a look at multiplying and dividing signed numbers. This means multiplying and dividing positive and negative numbers. The rule is very simple. It’s the same rule for multiplying and dividing. When two signs are the same, the answer is positive. When two signs are different, the answer is negative. Let’s have some quick examples. For this, both numbers are positive so the answer is positive. Even if the numbers are both negative, since the two signs are the same, the answer is still positive. These two numbers have different signs so the answer is negative. Again, different signs so the answer is negative. The order doesn’t matter here. The signs are different so it’s negative. The signs are the same so it’s positive. What if we have more than two numbers? Let’s solve it two at a time. The signs are different so it’s negative. Then move on to multiply the other number. In this case, both numbers have the same sign so the answer is positive. Just a recap, we have the same rules for multiplying and dividing.